This weeks favourites happen to be the easiest post of this type I have written. For once all my much loved products of the last week were neatly stashed in my make-up bag rather than scattered around the house, in various bags or even in the car. Perhaps miracles do exist? I have been more than enjoying Garnier 5 Second Perfect Blur this silky soft, silicone based primer gently fills in any of my enlarged pores, creates a velvety base for my make-up to glide on top off and helps prolong make-up wear. For change of £10 this is hands down one of the best perfecting primers I have ever used and really is so much better formulated than the likes of Benefit The Porefessional. 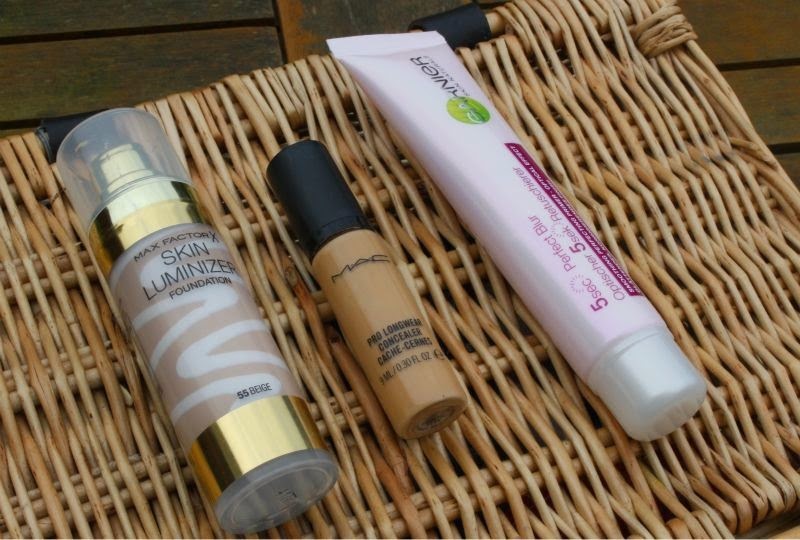 My skin is a little dull (the change of seasons often mean that my sleep cycle suffers...no real idea why but I do know my skin goes a little crazy) so I have been heavily relying on Max Factor's Skin Luminizer Foundation. Apparently Victoria Beckham cat walk models first sported this foundation last Fashion Week? Anyway this foundation not only evens out my skin tone, wears well but adds a little radiance too. Yes this is quite a creamy foundation but it doesn't seem to cause any problems on my oily skin - I think it would be a great choice for dry complexions too. To hid my under eye circles I have been relying on MAC Pro Longwear Concealer which is pretty unbeatable in my opinion. Yes it is slightly on the pricey side but a little goes a long way and it doesn't budge nor crease all day long. On my cheeks it has been a quick dab of the new Benefit Majorette Blush which is a peachy almost coral cream blush that settles to a powder on the skin. This blush has been created to be worn alone (my preference) or as a blush booster - you apply this as a base and then layer a blush over the top for a more intense does of colour. I rather like this worn on its own it gives a subtle, almost peaches and cream finish that is great for everyday wear. To highlight and again banish any dullness I have been dabbing on a little MeMeMe Beat the Blues Liquid Highlighter in Pearl Pink which is a great dupe for Benefit Highbeam. 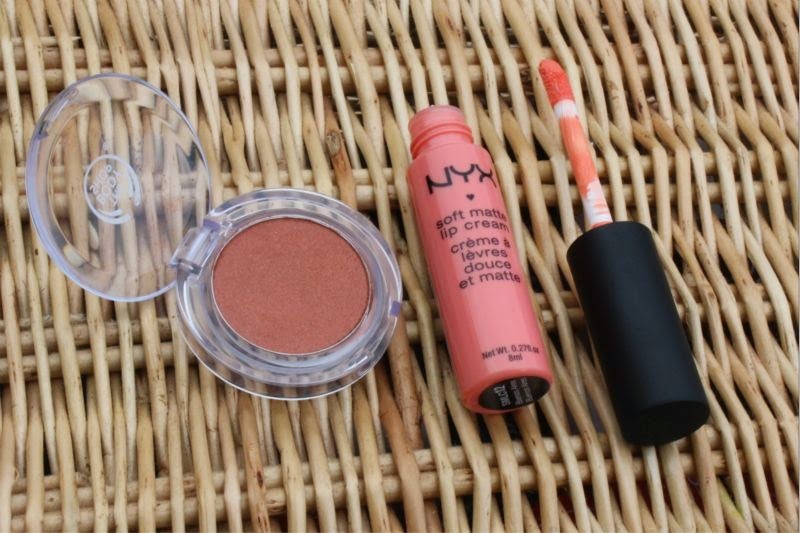 In true Adrienne style my lips have been a bright coral, namely NYX Soft Matte Lip Cream in Buenos Aires. I always forget just how much I love the NYX Soft Matte Lip Cream formula until I find one rolling about in the bottom of my bag. This soft matte cream lip colour glides on to the lips, lasts well and isn't overly drying. As for the colour? A bright orange based coral that is both shocking and utterly flattering. If like myself you have blue eyes do yourself a favour and purchase The Body Shop's Colour Crush Eyeshadow in Golden Cinnamon. A ruddy, red based brown that captures Autumn beautifully as well as enchancing blue/green eyes. I like that this shade is warm yet doesn't look "painful" on the eyes (anyone who has over applied a red based eyeshadow will understand only too well) and the formula is nothing short of great too! I love the NYX mattte lip creams. They are one of the few matte products that I can actually use. Seriously in love with the Pro Longwear concealer, can't live without it! I've been too scared to try the Maxfactor Foundation because of my oily skin, after I saw your review on it previously and now this, I definitely need to get it! I didn't realise how big majorette was until I saw this picture of it next to other products! The 5 second blur looks good so might get that. I have a hard time finding a good primer! That luminizer foundation looks pretty sweet! I need to try that - and the blush looks like such a great color! That blush looks gorgeous, such a nice colour! Can't wait to try the Benefit blush! Pro-Longwear is one of my all-time favourite concealers! The new benefit blush looks amazing, too. I love Benefit products and although I’m not a huge cream blush user, I’m curious to try their new ones! I really need to try that primer! Garnier products are always lovely, and I find The Porefessional always turns into little slugs and rolls off my face! Love that colour by NYX! The foundation and blusher looks lovely! I find it so strange that I absolutely hate the matte lip cream, and I have the exact same color. It completely dries me out and looks patchy after 10 minutes! I would really like to try the Max Factor Foundation ! I have been loving the Lorac Pro Pallete lately and lighting candles in the evening ! I really want to try the Benefit Majorette blush, it looks beautiful.